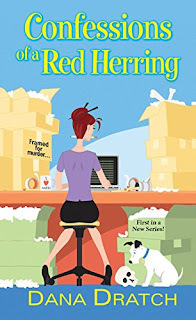 Cozy Review: Confessions of a Red Herring--with a visit from the author! Out of a job and under suspicion, Alex is running low on cash when she’s visited by a second disaster: her family. Soon her tiny bungalow is bursting with her nearest and not-so-dearest. To keep herself out of jail—and save what’s left of her sanity—Alex returns to her reporting roots. She goes undercover to reclaim her life, break the story, and unmask a murderer. Pretty much in that order. I'll admit I had my doubts about this one at first. 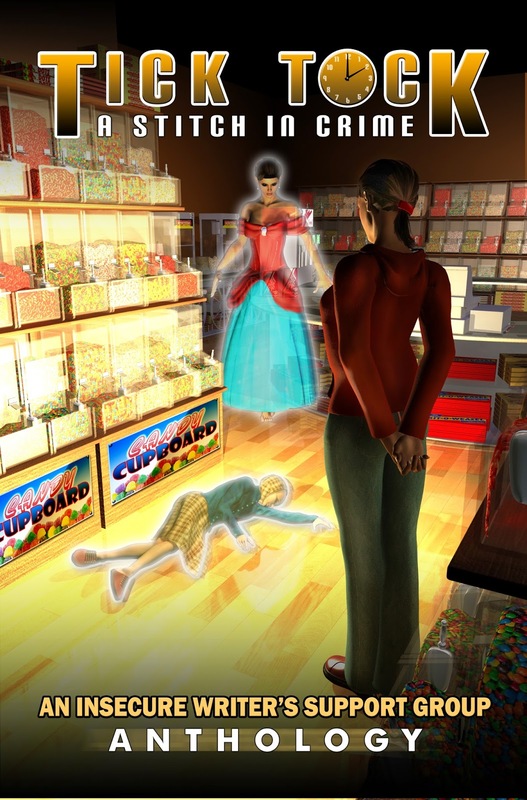 Alex seemed to fall into that too-common cozy-mystery category of young woman who can't get her life together. And for a while, it looked like that might be all she was. Then the author cranked up the disasters in her life until I was rolling my eyes. If you hit that point and want to quit, take my advice: keep going. 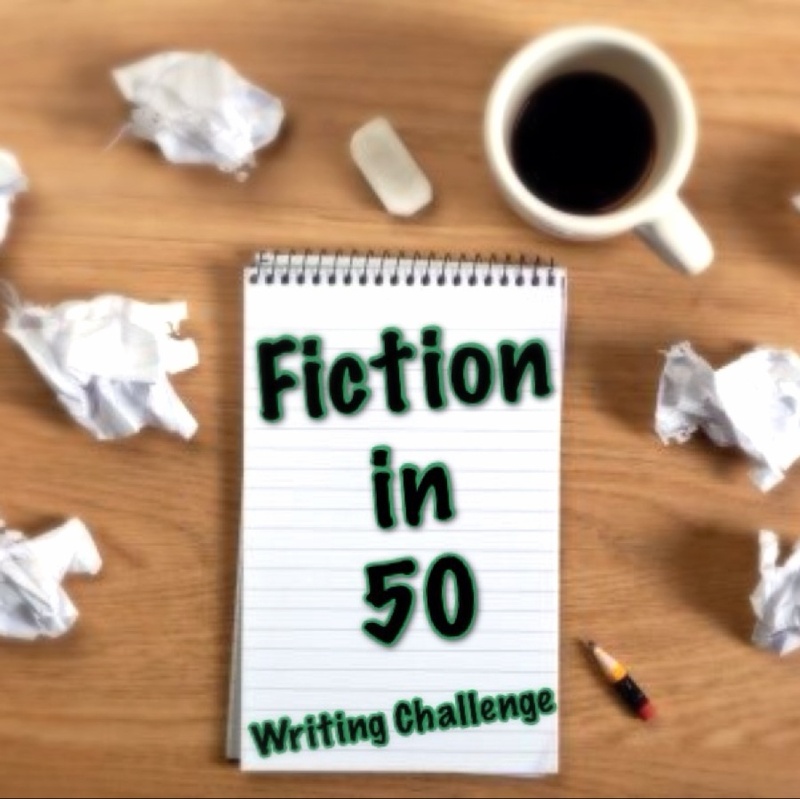 Right when I was ready to quit, the story grabbed me by the face and I was rolling through it at high speed, laughing at the insane plot and dying to know how it would all come out. So why the slow start? It's not that the book starts off slow--it doesn't. The author jumps right into a wild story. It just took me a while to warm to Alex, I guess. Once I did, the characters began to become real to me, and I wanted more. 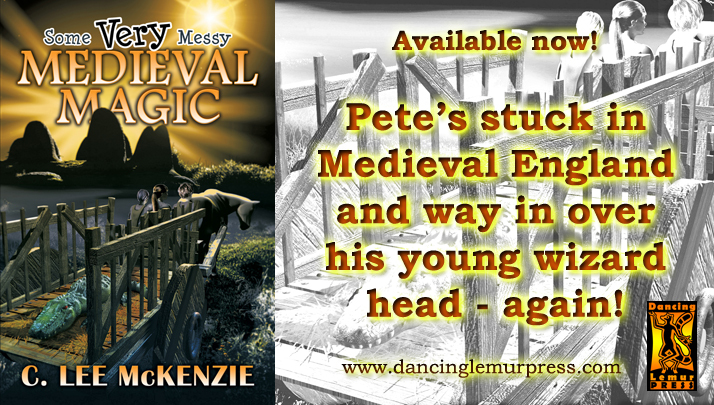 I did notice that the book is a bit longer than most first-in-series cozy mysteries, and maybe that led to my feelings that we were spending too long piling up the misery before it began to unravel. It was the point where things began to go right where I really bought into the story, so that's possible. Maybe I was just having a bad week. In any case, after passing the middle, I read the remaining 200+ pages in 2 sittings. The mystery itself wasn't too hard to figure out, but the author manages to create enough doubt to keep you reading (even aside from the desire to find out what Baba will do next). Alex's decision to root out the truth herself is pretty well justified (though it turns out the police are not being at all incompetent, just not fast enough for her). She needs to put a stop to this both to protect herself and because she is a reporter at heart, and for the most part it works, though there are some things she did that should have gotten her in a lot of trouble. My take-away: This cozy isn't obsessed with food, with romance, or with handicrafts. As far as I'm concerned, that's a huge plus. There are interesting characters, including the most annoying and adorable puppy ever. The mystery is a little transparent, but it holds together and the story is a blast. Read it! FTC Disclosure: I received an ARC of Confessions of a Red Herring from Great Escapes Free Book Tours, and received nothing further from the writer or publisher in exchange for my honest review. The opinions expressed are my own and those of no one else. I am disclosing this in accordance with the Federal Trade Commission's 16 CFR, Part 255: "Guides Concerning the Use of Endorsements and Testimonials in Advertising." By Dana DratchSome of the best characters in detective stories have four legs. Just like the real world, dogs in mystery fiction get the characters out of the house and out of their comfort zones. They’re a very real reason to unplug, soak up the natural world – and notice the surroundings. Like that strange car parked at the end of the block. Or a neighbor lurking in a garage not his own. They also solve a very real problem for writers: Revealing a protagonist’s thoughts. A character who talks to his dog is charming. A character who talks to thin air? Not so much. And in a mystery novel, there’s none better at sniffing out a body. Cats are just as curious, but dogs share what they find. At full volume. Asta. From Dashiell Hammett’s classic detective novel, “The Thin Man.” In the book, Asta is a female schnauzer. In the Hollywood movie (starring William Powell and Myrna Loy), he’s a wire-haired fox terrier. What they both have in common: A nose for trouble. Rowdy, Kimi and Sammy. The three Alaskan malamutes are regular--and crucial--co-stars of Susan Conant’s popular “Dog Lover’s Mysteries” series. If you don’t already suspect that dogs are capable of abstract thought, these three will show you otherwise. (And one anecdote--where Rowdy hides his human’s socks just to gauge her reaction--is borrowed from real life.) These three are smart, funny and exuberant. Chet. The high-energy co-star of Spencer Quinn’s “Chet and Bernie” mysteries, Chet is the series narrator--which gives readers insight into his peripatetic dog mind. Also known as “Chet the Jet,” he’s the first to admit he’s fast, as well as smart. (And he’s right.) When you hang out with Chet, expect to discover not just how the suspects look and act, but also how they smell. Blanche. A canine character in Jonathan Kellerman’s best-selling “Alex Delaware” series. Unlike her predecessor, Spike, Blanche definitely sees Alex as her No. 1 human. And she has a soft spot for Delaware’s two-legged cop buddy, Milo, who slips her food on the sly. Besides, who can resist a French bulldog who smiles? Tara. A great four-legged character in David Rosenfelt’s best-selling “Andy Carpenter” series. The fictional Tara, a golden retriever, was inspired by the author’s own dog of the same name. Best of all, she shares her moniker with the author’s real-lifeTara Foundation--which has rescued and placed thousands of dogs. Now that’s a very good girl. Dana Dratch is the author of CONFESSIONS OF A RED HERRING, which came out May 29. 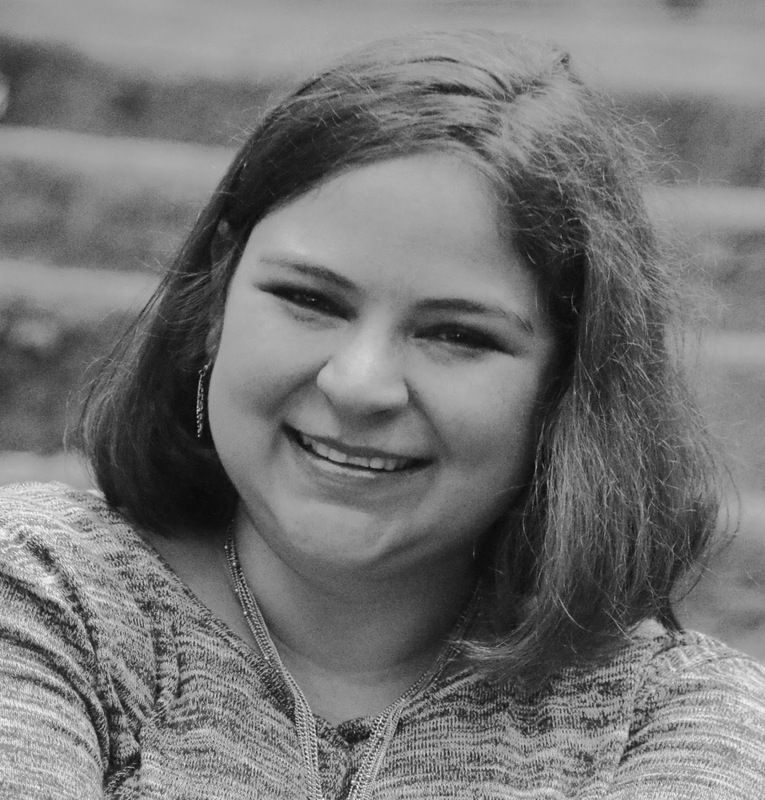 A former newspaper reporter and current personal finance writer, she’s currently writing the sequel, SEEING RED, which has Alex, rescue-pup Lucy, and the whole crazy Vlodnachek family going up against spies, art thieves and a very determined murderer. And there's more! Join the giveaway for your own copy of the book! Publisher: Dancing Lemur Press, May 15, 2018. I was running out of protests. Even if the cat died of natural causes, someone was using it to threaten poor Karl, who was harmless despite a neighborhood tendency to think his reluctance to talk meant he wasn’t all there. I'm sure Karl Haalverson's daffodils look a lot better than this. His fence, too. And now... a special interview with the author! NL: When did you start writing? 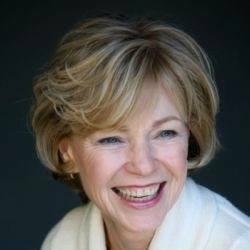 Did you always know you wanted to be a writer, or did you stumble into it later in life? Ronel: I’ve always written a couple of stories to entertain myself, but I seriously started writing ten years ago. 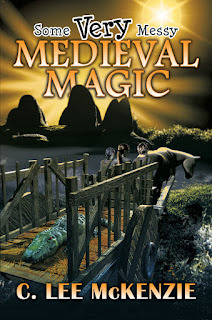 In that time, I’ve learned how to write properly, created entire worlds, did a lot of research into several folklore creatures, realised in which genre I want to write, and found my voice. NL: What are your books about and who is the audience? 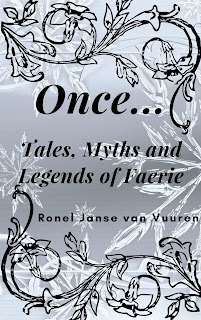 Ronel: This book, “Once…”, is a collection of short stories about how Faerie changed and the impact on the mortal realm when magic and fae infiltrated it. There are a few original stories steeped in folklore and a couple of fairy tale retellings with a Dark Fantasy twist. My intended audience is New Adult, but I’ve had readers of all ages for the Afrikaans version “Eens…” who bought it for themselves and enjoyed it enough to pass it on to their children and parents. NL: Do your stories carry a message? Ronel: Absolutely. Dark fantasy is all about examining the human condition, looking at the consequences of actions and decisions, and how the beliefs we hold can change the way we see our world. 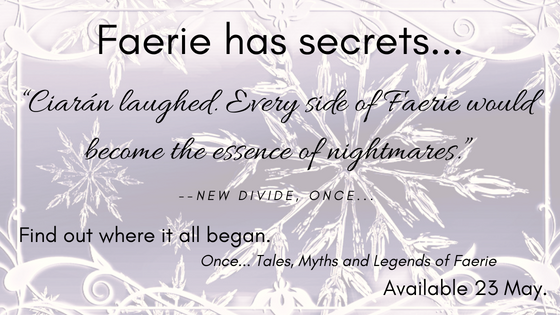 I think “Rumour Has It”, “New Divide” and “Castle of Glass” depict all of this from different points of view about the same moment in Faerie history very well. NL: Thanks for telling us about your book! Now tell us, what is the best thing about being a writer? Ronel: Creating worlds, playing “what if?” and talking to my fictional friends. NL: Yeah, we all like having a good reason to listen to the voices in our heads! Do you draft your books longhand or compose at the keyboard? NL: You talked about doing research for the book. What’s the weirdest thing you’ve had to research for one of your books? Ronel: I research a lot of folklore, most of it weird, so let me think… Probably the protein value of worms and if they’re a good idea for breakfast. The main character in “The Ashiest Princess” has them for breakfast every morning. Not all that odd: worms are a staple food in many communities. NL: Well, the birds have worms for breakfast... Do you use a detailed outline before you start writing, or... ? Ronel: It depends on the story. Some stories insist on being written before I can think about it – it’s like they’re already in my head, just waiting to be written down. Afterwards I do an outline and create a proper plot. Other stories insist on meticulous outlines and research. NL: You live in South Africa. Since most of my readers are in the US or England, tell us a bit about that! Ronel: Well, we have sun all year round which means I have to keep the curtains closed in my study or I’ll never get any writing done! Once everything is dry in the winter months, a few crazies believe that they should burn everything down. It usually starts with a veldfire – and last year it ended with someone setting fire to my property (I live on an agricultural holding with horses, chickens, etc.) that we were lucky enough to stop before it destroyed everything. There are horrible things in my country – like the endless attacks on farmers – but as long as you keep your head, stay alert and don’t act foolishly, there are so many things to enjoy and savour. We have gorgeous botanical gardens that are open year-round, each season brings its own beautiful plants and temperatures. If you’re an ocean person, we have the warm Indian Ocean on one side and the cold Atlantic Ocean on the other, and that wonderful sight where the two oceans meet and clash. We have forests, deserts, nature reserves, different biomes and animals to visit in their – mostly – natural habitat. You can turn every weekend into an adventure. There’s so much more to say, but that will take an entire post ;-) In one of my stories in “Once…” I used the desert and forest elements, so it can almost feel like you’re in South Africa while reading “The Fae of Bremen”. Or you can run over a veld (field in South African terminology) with “The Field Mouse”. Thanks for having me, Rebecca. Thanks for coming by! Your description of the country does make me want to visit, especially to watch the two oceans come together. 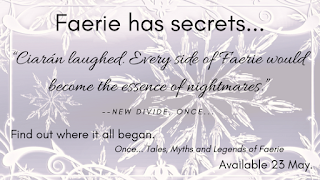 Once... is available today, so check it out! 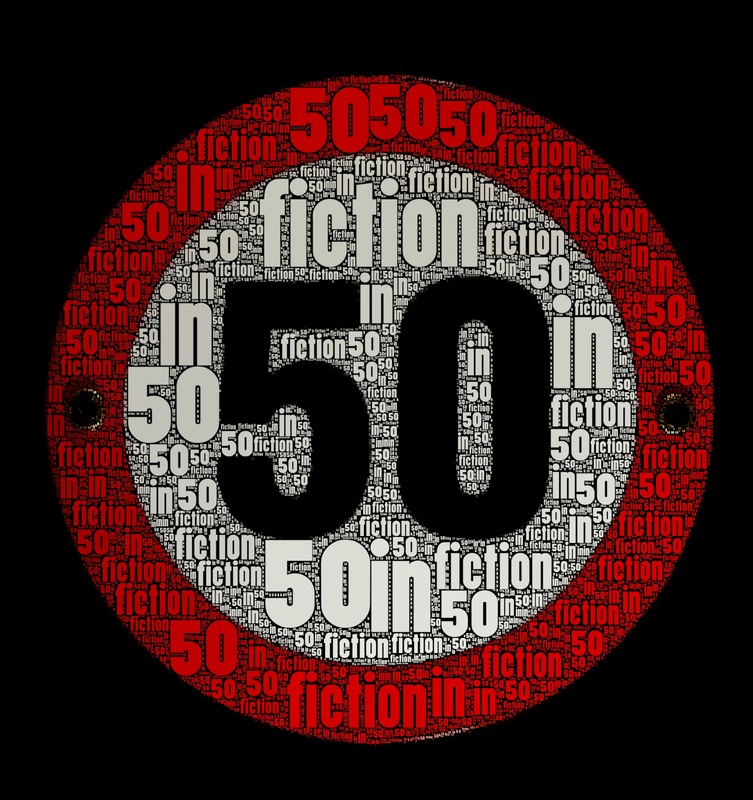 Thanks to a lot going on this weekend, we seem to have forgotten to post our usual heads-up for Fi50. So here it is. "The End is in the Beginning." You can use the prompt as a title, or not. Really, there aren't many rules, other than 50 words or less. Today we're helping promote Elaine Kaye's new picture book by participating in the Dr. Mom blog hop! Share a favorite memory you have of your mom. Or just share a picture of your mom that you cherish. Or you can do both! Hey, this is harder than it looks. My mom is 89. I'm... uh, not 20 anymore (notice she's old enough to brag about her age. I'm young enough be trying to forget). That's a lot of amazing memories! I'm tempted to share the wonderful little book I wrote about my mom when I was in the 1st grade or thereabouts, but I don't want to distract from Ms. Kaye's adorable book, so I'll do that another time. Instead, let me tell you about a favorite family photo (sadly, it seems to have been lost). This was back in the days when cameras not only used film, but if you didn't advance the film yourself, you could take two pictures on top of each other. One of Dad's favorite possessions was our bright red, 17' canoe. When we kids were little, we could all 5 get it, and we enjoyed family outings on quiet lakes (Dad did some white-water, or at least whitish-water, stuff, but not with us). So Dad takes a photo up the canoe, where Mom is seated in the front. The next photo shot was of a buffalo (I have no idea where). You guessed it: a double-exposure, with the buffalo taking Mom's place in the front of the canoe. Lucky for Dad that Mom has a great sense of humor, and laughed as hard as the rest of us! 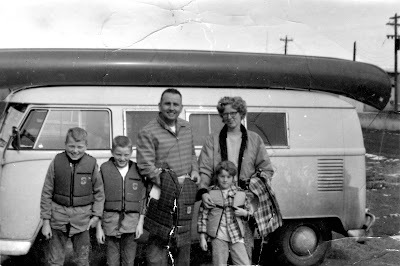 Since I don't have that photo, I'll share this one of all 5 of us, with the canoe and our VW bus, sometime in the late 60s. And now for the main feature! It’s Saturday, and Gregory Green can’t wait to have fun with his dad on the riding lawnmower, but something is wrong. Sammy, his teddy bear and best friend, won’t get out of bed. 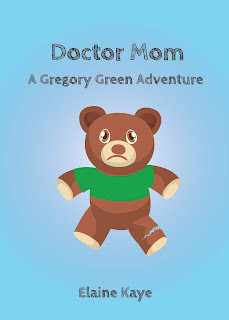 Gregory is worried when he sees Sammy’s left leg is torn. This is a case for Doctor Mom! Can they fix Sammy? And just how did Sammy get hurt in the first place? 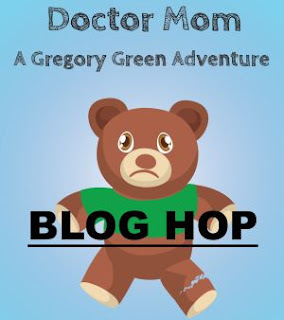 Now hop on around and see what other bloggers have to say about their moms! 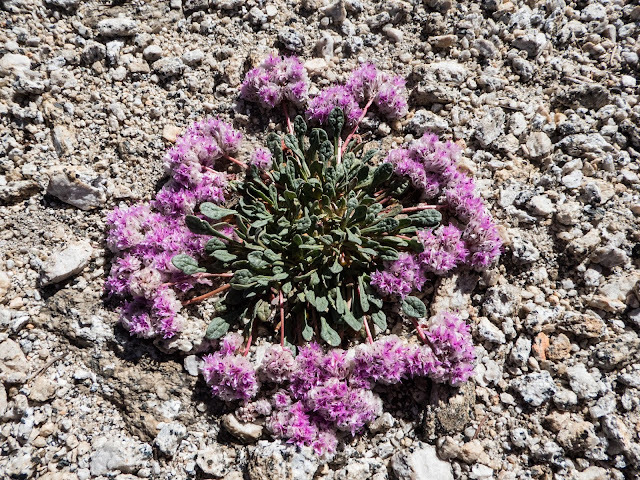 A month or so back I did a wildflower post focused on desert wildflowers, and promised to get to the alpine flowers in another post. 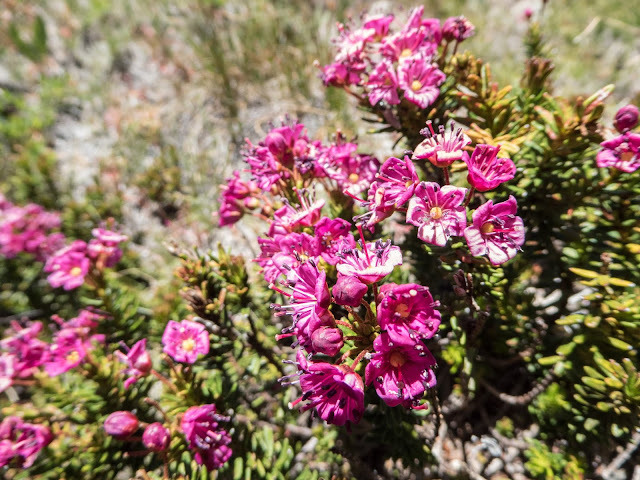 Then I got distracted... so here is a collection of alpine flowers from the Washington Cascades and a few from the Sierra Nevada mountains of California. 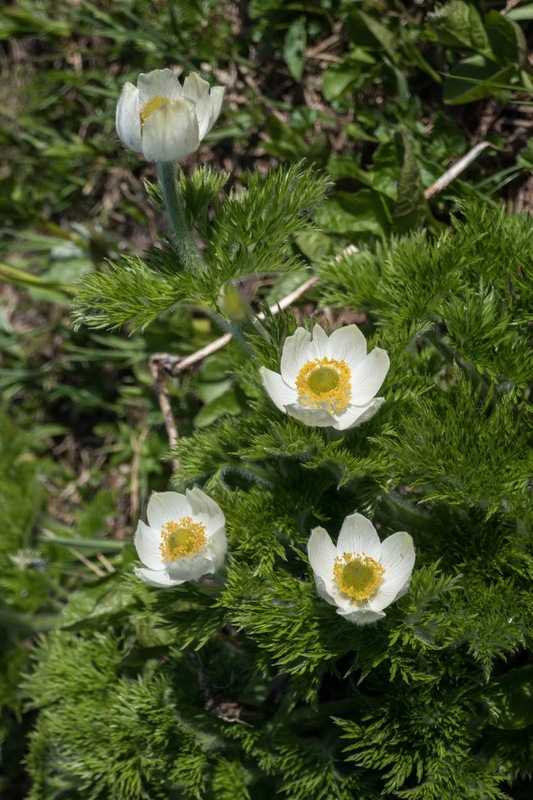 These first 2 are more sub-alpine flowers, found in the forests. I'm not actually sure what this is. 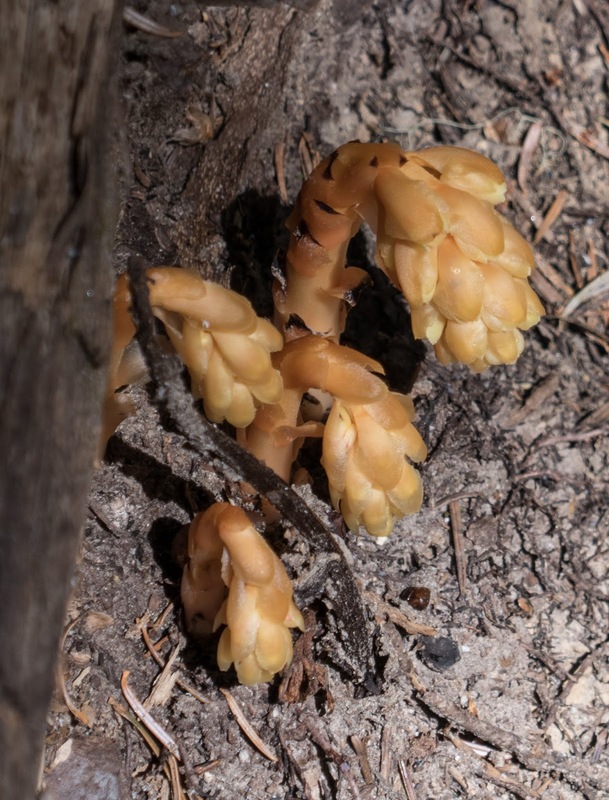 This is a saprophyte--it gets nutrients from the soil, not photosynthesis. 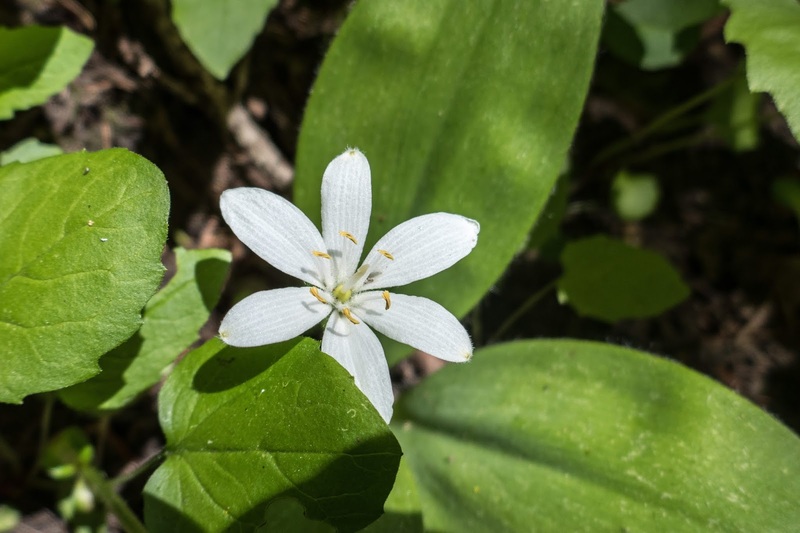 This one grows in wet places, both above and below tree line, and in both mountain ranges. In fact, most of these flowers grow in both the Cascades and the Sierra, though some show variations between. This one, I think, is Cascades only. At least, I don't think I've seen it in the Sierra. Pasque flower. 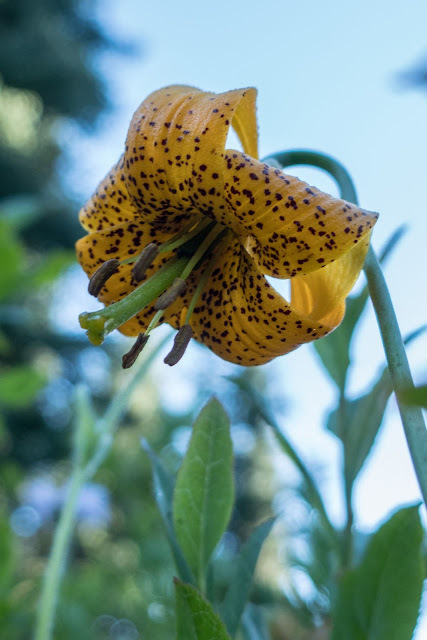 Believe it or not, this is the same flower, in bloom. I wish I had a picture of the in-between stage, because it looks totally different again. Sadly, none of those shots came out. 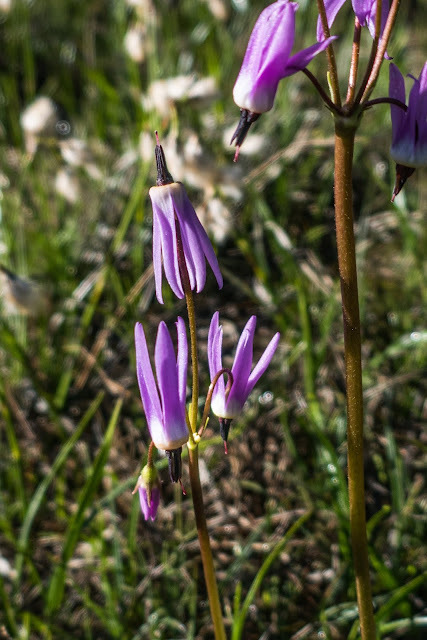 Assorted lilies and columbines can be found in both ranges. 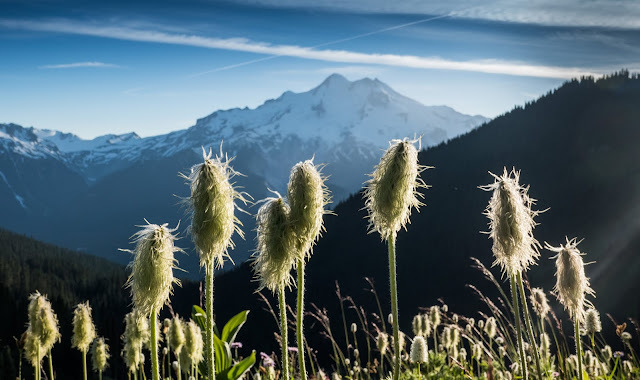 Columbine, despite looking fragile, mostly seems to grow in the shade of rocks on otherwise bare alpine slopes. Either a tiger lily or a leopard lily. They grow below tree line. 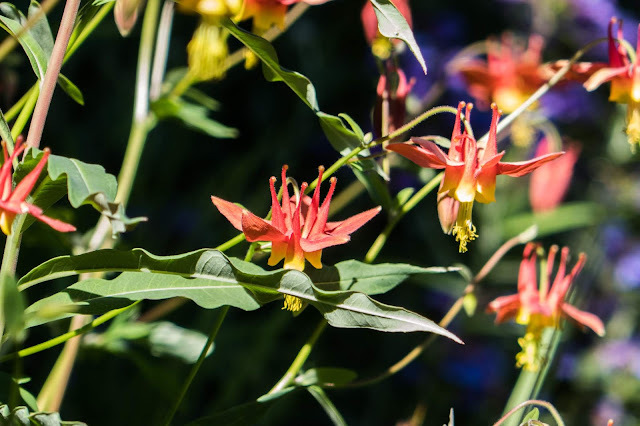 Cascade columbines. The ones in the Sierra seem to be mostly a light, almost cream color. In the Rockies they are more apt to be 2-toned blue flowers. 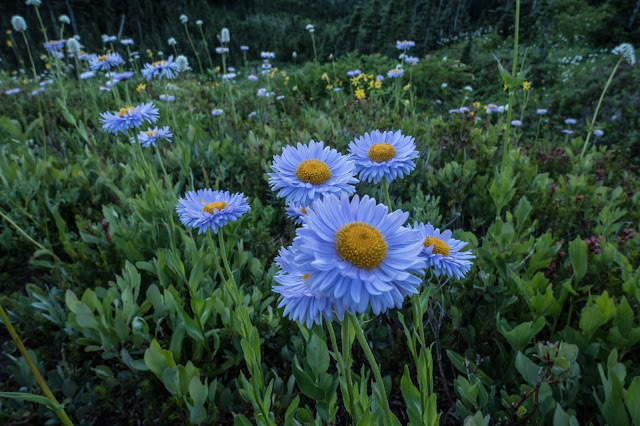 Some kind of daisy (aster). These seemed to hang out right about treeline on last summer's Glacier Peak trip. 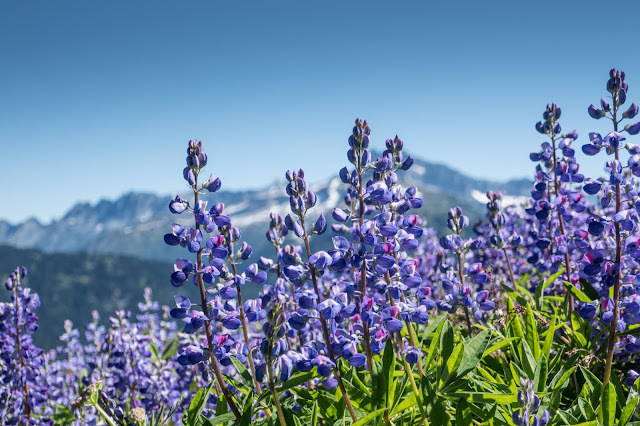 Lupine grow everywhere. Mountains, deserts, seashore. They also come in every size, from tiny things to giant bushes (to really giant flowers in Peru). 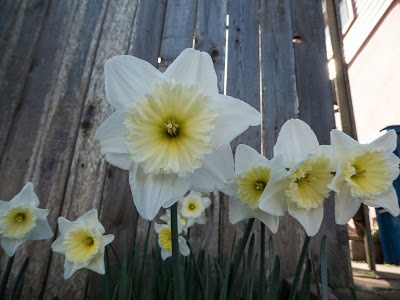 These were modest, except in their profusion. Lupine up close. The leaves are a giveaway, though the flowers tell you it's in the pea family. 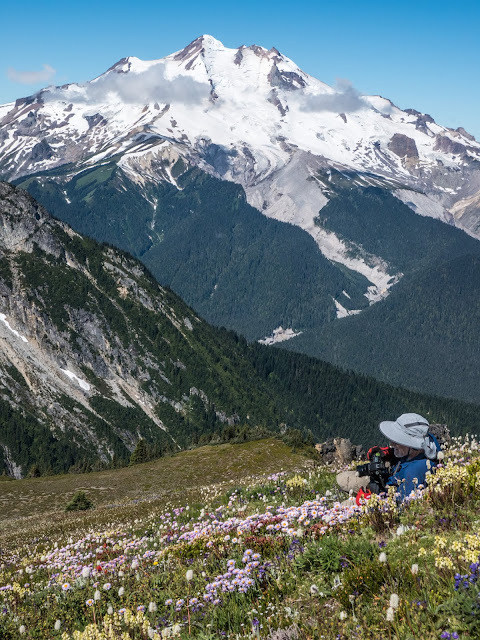 Sometimes an alpine meadow is a flower garden with a stunning backdrop. Daisies, bistort, white and blue lupine, maybe some heather, and a photographer. 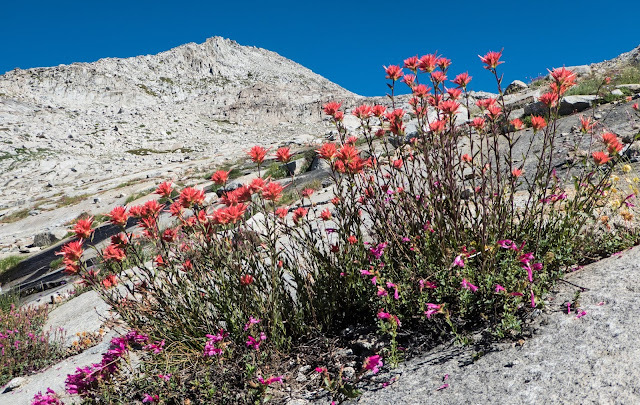 Indian paintbrush is another flower that grows everywhere, and in a number of colors, though most are shades of red. This paintbrush has a penstemon growing with it, each probably offering shade to the other. Alpine heather I see more in the Sierra, though I think it's everywhere. 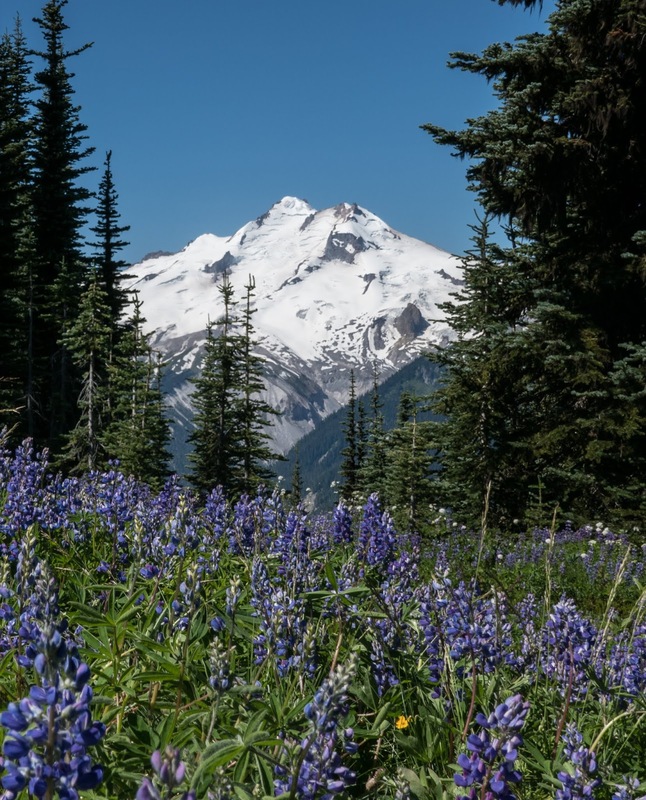 The next couple really seem to grow only in the alpine, and in the less promising spots, at that. Pussytoes sprout up where the granite is only barely turning to soil. 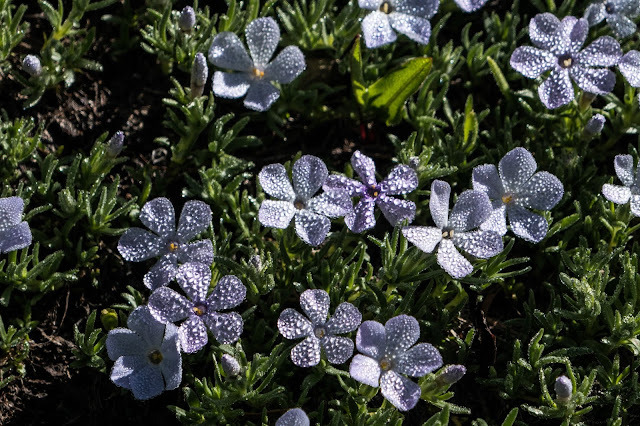 Phlox grows in small, low mats in similarly inhospitable spots. This one is covered with the morning dew still. 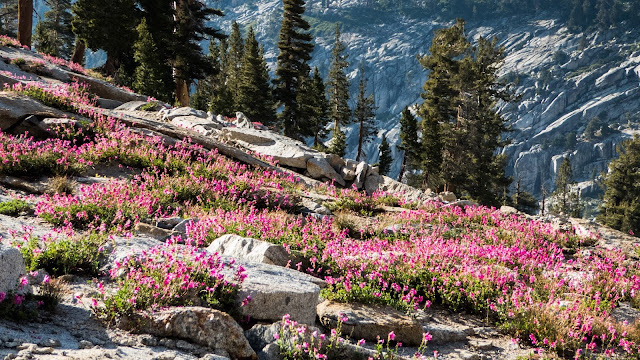 The Sierra isn't noted for flowers the way the Rocky Mountains are, but you can still get some amazing displays there. You just have to put yourself out there at the right time--and maybe get a bit lucky, too. Hope you've enjoyed the eye candy! Being part of the IWSG anthology (that would be Tick Tock: A Stitch in Crime) has been an education for me. Not only did I pick up a new awareness of some minor writing issues I have (mostly in the area of comma abuse), but the whole marketing process has been educational. Probably not educational enough, but I have picked up a few things to contemplate. 1. Get the word out, early and late. 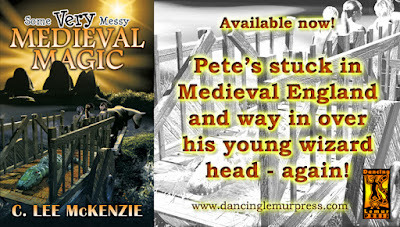 The publisher, Dancing Lemur Press, started early with tweets and FB posts, and got all of us authors to set up a blog and do regular posts about our stories, writing process, whatever. And they started early to set up a blog tour, or at least appearances on a number of blogs, with interviews, reviews, and so on. The book came out May 1, and that publicity push is still going on (including a Rafflecopter giveaway of a cool Tick Tock tote bag running to June 6!). This one isn't so hard. 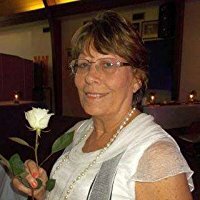 I'm learning how to get more people involved in a release, and I know that I can arrange a blog tour through Great Escapes. 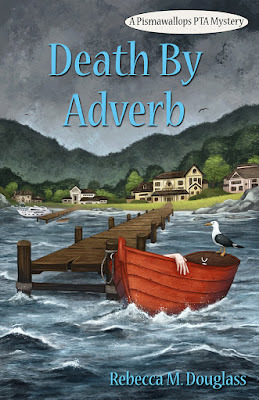 I haven't done that yet for Death By Adverb, but I had a number of very helpful blog posts about it, thanks to my fellow IWSG authors! 2. Don't be timid: the publisher sends announcements to all sorts of bookstores, and we writers are meant to follow up by suggesting we can come and do signings, etc. This one's hard. I have an almost insurmountable reluctance to put myself forward in that way. It feels pushy, and I've not yet figured out how to cure myself of a well-brought-up modesty. 3. I didn't learn this one from the Tick Tock release, but push the backlist (well, I see them doing that some, mentioning the previous IWSG anthologies along with ours, which is #3--check them all out). I finally saw a benefit from having a series, as I put the first two Pismawallops PTA books on sale during the month following the release of the new book, and included that information in the post on release day. Sales picked up, and I hope some of those will lead to new fans for the series. I'm planning to work on the backlist this summer, as I'll not be able to do much writing (I am still trying to do some submissions each month, though). I intend to do a special "Hero Month" promotion for Halitor the Hero, so watch this space--and watch for other special offers, as I need to clear out my inventory before we move! The Hero promotion is still in the planning stages, but let me know if you want to be involved--I'll keep it simple. 4. Finally, just from following so many other writers, I realize that I've been remiss about my newsletter. In fact, I can't remember when I did the last one, and I'm overdue. I also apparently need to update my sign-up to meet new regulations. I'll have to get on that, and encourage everyone to sign up once I do. But in any case, I need to send out a newsletter, and soon. You can bet that newsletter will have some special offers in it! For the moment, that's about it for what I know about marketing. It's no place for an introvert, yet we writers have to overcome our natural tendencies and do it somehow! He murdered the language, but who murdered him? JJ McGregor’s not having her best summer. Her arm’s in a cast, her jeans are too tight, and her son’s in Texas with his dad. To make matters worse, she hasn’t spoken to Police Chief Ron Karlson since June. What’s more, she’s gotten fired by the biggest bully on Pismawallops Island. 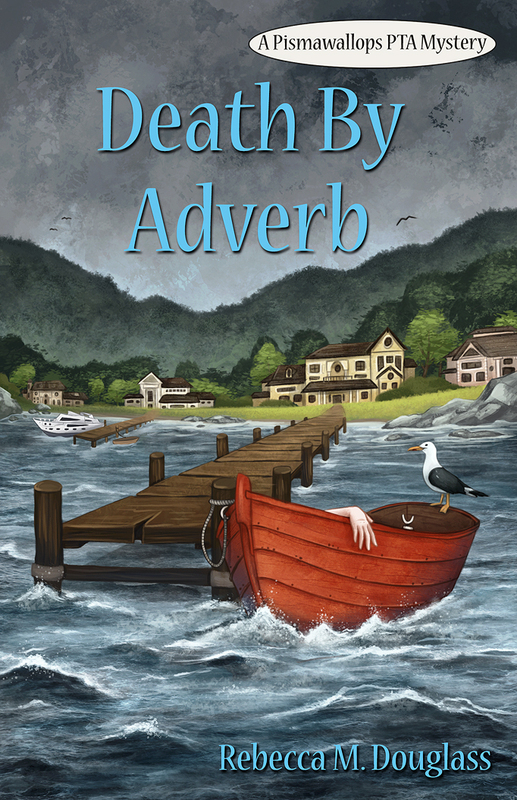 JJ thinks her boss's vile prose and grammar are poisonous, but he's the one who turns up dead, and against all odds her summer gets worse. Now there’s a killer on the loose, JJ's on the suspect list, and she'd better make her peace with Ron before someone decides she's gone too far in the defense of good writing!